In 1989 Samuel Mangena left a good job at ZZ2 Tomatoes. After working there for 15 years, he realised that he had learned enough about the business of farming to go it alone. He had experience of fertilisers, pesticides, irrigation machinery and disease control. He even had the ability to know the grades of tomatoes by just looking at them. "It was time for me to leave and follow my heart", said Mangena. Armed with his knowledge of farming and his passion to make a difference, Mangena talked to the local chief and local government near Phalaborwa for help. They gave him a barren piece of land that was once a road. Using nothing more than a pick-axe and a fork, he managed to turn this dry land into a vegetable farm. He often worked right into the night with less than four hours of sleep. Now known as the Mangena Community Farm, it has since been built up to a two-hectare business venture. Products range from tomatoes, onions, spinach, cabbage, butternut, carrots and other vegetables. 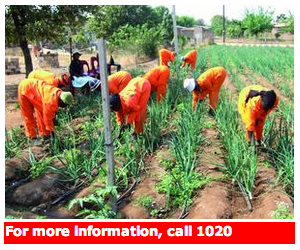 All of this would not have been possible without the help of the EPWP, through the Limpopo Department of Agriculture and the Phalaborwa Municipality. They have helped the Mangena Community Farm with a business plan, as well as an irrigation system. "I now sell my vegetables to businesses around Phalaborwa including hotels, cafés and big shops like Pick & Pay and Spar". To keep costs down, Mangena doesn't deliver, but phones to tell them when the vegetables are ready to be collected. "I also supply a lot of produce to wholesalers. A crate of tomatoes I sell for R80 to retailers goes for only R60 to wholesalers," he said. 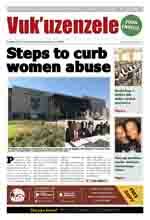 Mangena's workers are all women. "Women are productive, easy to mentor and make better farmers," he said. 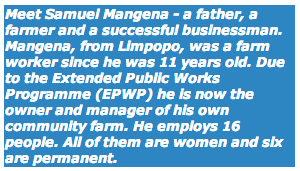 Mangena helps the community by sometimes donating his produce to poor households. He also helps learners from local schools with farming lessons on his plot. He is now working on a project to pump water after finding a borehole line where two underground rivers meet. Because the borehole is close to the school, it will benefit both the school and the community.